Expect alcoholic main courses onboard! Pardon me for not updating my food blog as frequently these days. It's been pretty challenging maintaining two blogs in parallel. 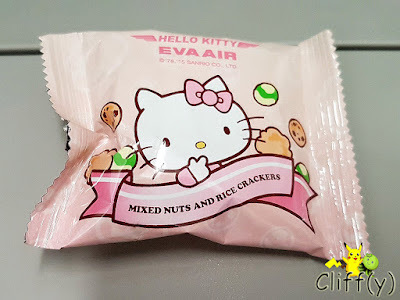 Anyway, today's post is on two separate in-flight meals onboard EVA Air, one of which was a part of the Hello Kitty experience from Taipei, Taiwan to Singapore. 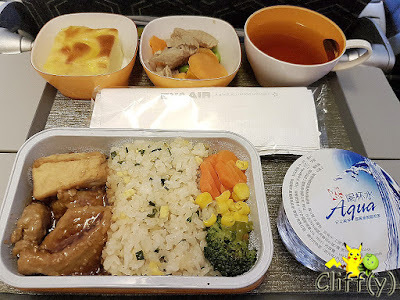 As the plane departed from Taipei Taoyuan International Airport at 7.40am, breakfast would be served. 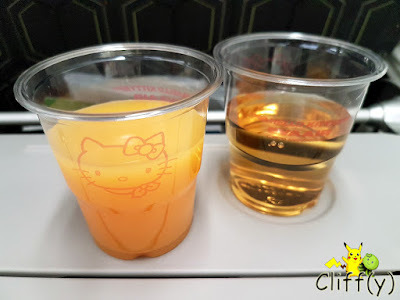 I had a cup of apple juice to quench my thirst, while my BFF had a cup of orange juice. They weren't chilled. 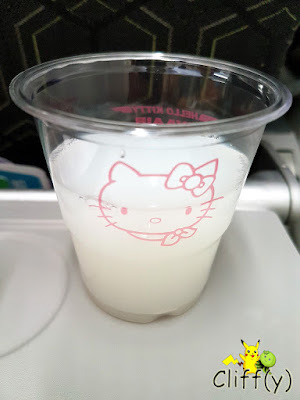 To accompany my packet mixed nuts and rice crackers, I requested for a cup of Calpis that had been adequately chilled. Thinking that omelette would appear on the menu, I really didn't expect to see braised beef as a choice of main course for breakfast. While the beef was tender, the red wine sauce wasn't particularly interesting. The potatoes, carrots and broccoli were cooked well. 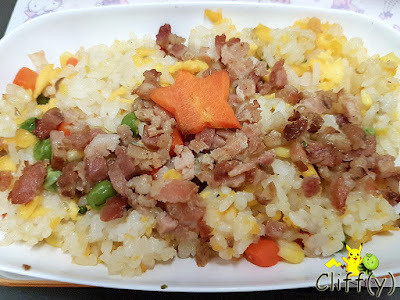 As for the colourful fried rice cooked with eggs and frozen vegetables, it was moist and appetising enough. They weren't stingy with the amount of bacon that wasn't overly oily. 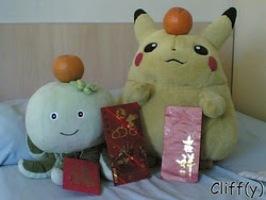 Similar to the other main course, there was a star-shaped carrot, but it was dehydrated. To improve digestion, I gulped down the low-fat yogurt with strawberry flavour. The bread was pretty soft, served with a packet of salted butter. Red wine was my first choice of beverage to go with my beef main course, followed by Oolong tea that was quite potent. 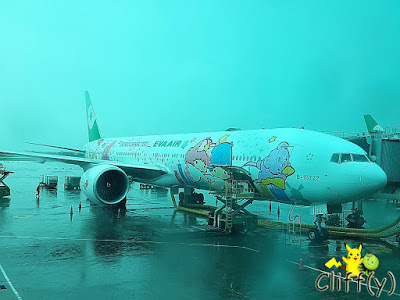 Besides that, I also flew with EVA Air from Manila, the Philippines to Taipei. Everyone received the same main course for lunch, unless he/she had pre-ordered a special meal. I wasn't too sure if that was supposed to be an appetiser dish, but it certainly didn't look like one. It featured sliced pork with boiled carrots and edamame (Japanese green soybeans) that came at cabin temperature. The main course took me by surprise in a good way. The pork and beancurd were cooked with strong Chinese wine that made it noticeably alcoholic and highly fragrant. The fried rice was cooked with eggs and dried chives. Served on the side were broccoli, carrots and corns that weren't overcooked. The lemon cake was a decent dessert item, for it was quite velvety with the aroma of the said citrus fruit. Having said that, it could be made slightly sweeter. 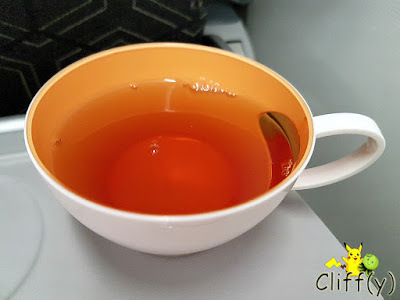 I had a cup of black tea that was pretty strong to go with my meal. There was also a cup of mineral water placed on each tray. 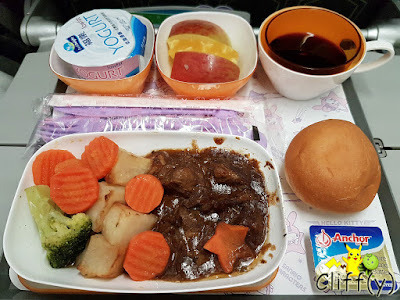 The alcoholic pork was certainly one of the best food I've ever had in the Economy Class. 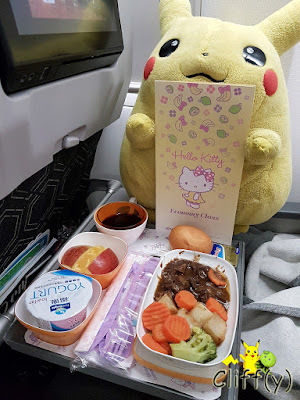 Pika's advice: Given the main courses featuring alcohol and pork as shown above, don't forget to pre-book your meal should you not consume any of them.